The Broadway Center For The Performing Arts is hosting a fundraising auction, in support of providing performing arts opportunities for young people, in Tacoma, WA. The person in charge of the auction visited Catwalk Gallery, saw my work there and asked if I could contribute an item to the auction. All proceeds from Star Chefs on Broadway support a stellar cause: The largest arts in education program in Washington State, serving 35,000 students and teachers per year. For most of these kids, the Broadway Center is their only arts experience of any kind. Many face a tough mix of economic need, cultural barriers, geographic and social isolation. No child is ever turned away because of the inability to pay. This year, with your help, we’ll raise more than $300,000 through silent and live auctions to help these kids access vital arts education programs, from school matinée performances to youth violence prevention programs, and from original touring shows celebrating the legacy of Martin Luther King Jr. to year round classes and workshops. Here’s the necklace that I designed for the Broadway Center’s auction. 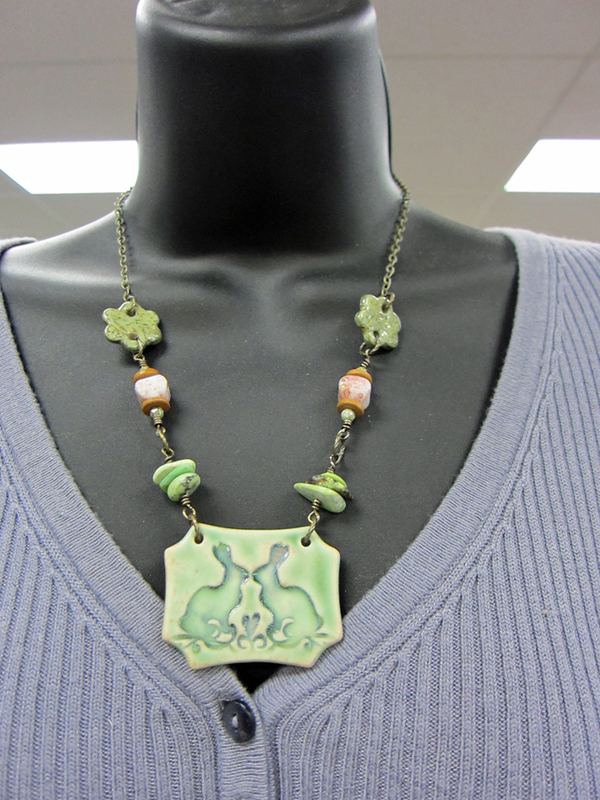 The necklace features lampwork glass by Beads and Botanicals and Genea Beads, plus ceramic beads from Gaea. I was lucky enough to snag a bunny pendant from Nancy Schindler of Round Rabbit Extra! Nancy’s work is so sought after that the moment she posts something new, it sells out. I just happened to be at the right place at the right time! I love bunnies – not just at Easter – but all year round. Who can resist their so-soft fur, wiggly noses, and bunny ears? Melt. I had a German professor in college that had a pet bunny that was trained to use a kitty litter box. So therefore the bunny didn’t need to be caged. She just hopped all around his house. I thought it was so cool! 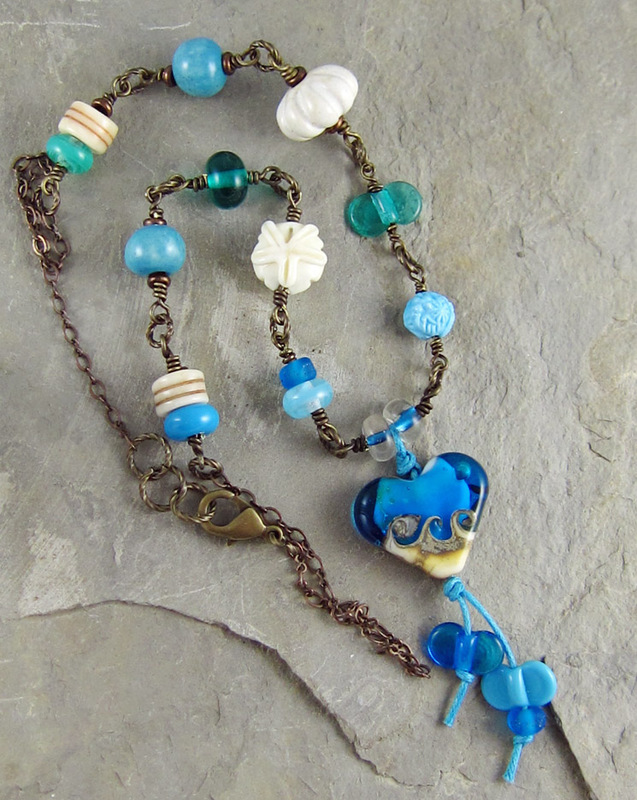 This entry was posted in Art Beads and Components, Jewelry and tagged artisan jewelry components, bead blog, Beads, bunies, ceramic, earrings, Easter, handmade, handmade jewelry, lampwork, Linda Landig Jewelry, necklaces, Rabbits by Linda Landig. Bookmark the permalink. It is such a joy to read about another of the wonderful ways jewellery can help others, Linda. Before I embarked on this creative journey, I couldn’t have imagined the somewhat humble act, of choosing pretty components, could have such far-reaching positive benefits. Thank you for sharing your beautiful pieces. I always feel honoured when I hold the handmade work of the fine artisans you mentioned. I love this piece! Very unusual but it’s a real “statement” piece. I think it’s very fun.